The cauldron in my belly. The same night I was asked to do the show for the Bay City Arts Center, a friend also asked me if I was still having food troubles. When I said yes, she said that she thought it might help me to do the 10 day silent meditation retreat at the Northwest Vipassana Center. It was one of those moments when things just go clink into place. Spirit speaking through a dear friend to give me something I needed. Tom and I did a first retreat in April 2004. There were several points during it when I felt like I was completely immersed in fire. And it was only partly because of my hot flashes! I felt like I must be singeing the people around me and afterwards I surreptitiously checked for char marks on my cushion. I was that hot. And, yes, the process did help my digestive problems in lots of ways. The on-going meditation practice* has given me an addition to yoga to focus into my body. Though nothing like the fiery intensity of sitting 10 hours each day on the retreat! Words couldn’t explain that experience so I picked up my brush, working both larger and more carefully and over a longer period of time than usual to capture the feeling and honor the guides who came to my aid. I don’t know if the teachers at the Vipassana Center would have approved of some of the beings who were around me in the throes of the fire but it was their presence that got me through it. I only know who a few of them were. Mother Kali from India (upper right) is She Who Cuts the Cords. She’s the midwife who knows when we’re ready to breathe on our own. She’s the fiercely compassionate one who sends fire to burn out the old stuck places of our egos – and then dances upon it, bones clanking. I called on her for help throughout. The Shaman of Wands from the Motherpeace deck (lower right) appeared many times over several months that year to comfort and inspire. Gentle male of steady power. Maori, I think, at least to me. A Healer. A Guide. Shiva (lower left) – Especially difficult to summarize, but an Indian male god as fierce as Kali Ma. Life Force pushing up the green growing energy. Pele – Hawaiian Fire Goddess (lower middle) – the volcano that burned under and through me. Kwan Yin from Asia (upper left) – showed up flitting, fleeting on the retreat. She was the hardest to pull together for the painting. 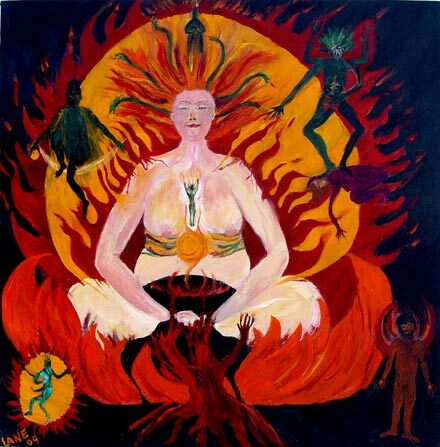 Journal 5/4/04: Now I have the image I want for the painting – the Kwan Yin in Nancy Burton’s office. She lounges there deceptively casual, a ball held loosely in her hand. As I lay there on the table with an acupuncture needle in my third eye (among other places), I realized she is about to throw that ball of power (as Nancy described it) to me. So now I replay that throw over and over in my mind. Am I practicing? Did she do it right in that minute? Or is it yet to come? Does it come again and again – new pieces each time I see it.